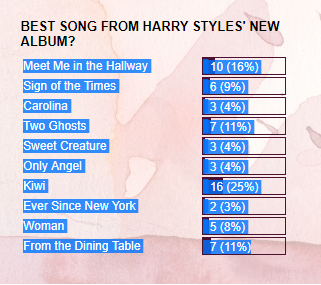 A year ago, I created a poll on my website that asked: What is the best song from Harry Styles' new album? The poll was expected to close in a year. However, blogger.com actually stopped the poll a month early because they are retiring the poll feature. (Sad!!! That means I will have to find a new way to post a poll on my site). THE WINNER IS KIWI!!! Haha, looks like Kiwi became all our favorite songs when Harry started singing it so much on tour. I wrote about that here: Harry Styles at Radio City Music Hall: Kiwi is now my favorite song. I'm surprised Meet Me In The Hallway is so high up. It's like a deep cut but I guess we all enjoy emotional!Harry. [This can be seen again with Two Ghosts and From The Dining Table being number 3 - both emotional songs]. I think it's interesting Every Since New York is last place. I agree!! That song is vague and some may feel bored by it. I'm surprised Carolina and Only Angel are so low on this list - they are fun, rock songs I thought every one would enjoy. Let me know if you agree or disagree with the poll results in the comments. What is your favorite Harry Styles song? Everything Wrong With Drake's "I'm Upset"